And so it wasn't literally about angels and demons after all, just as how a friend expected it to be. Though it was as sensationalized and intriguing as Dan Brown's The Da Vinci Code, Angels and Demons made its way to the hearts of every movie-goer. Literally, I was like falling in line to David Cook and David Archuleta's back-to-back concert in Manila, the line seem to be that long. Angels and Demons is yet again another adaptation from Dan Brown's novel, and yes, I haven't read it and it's much disappointing from my end to not have a single idea about what the film or the novel is about. But thanks to a very unruffled storyline, I got to have a full grasp of the film. 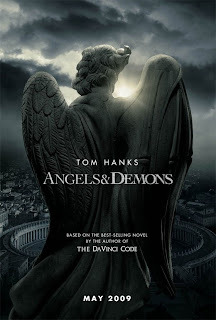 Angels and Demons tells us the story of the Illuminati, an organization dedicated to unravel the scientific truth behind the teachings of the Church and Robert Langdon, a Symbologist and professor from Harvard University, seeks to solve the mystery of the four Cardinals who were lost right before the conclave's assembly in the Sistine Chapel. As said, the story telling is very strong and in tact. Ron Howard and Dan Brown's collaboration gave way to a masterpiece. You would notice how each detail of the film was carefully thought over and over to produce a film of high acclaims. You would definitely love the cinematography. They captured the beauty of Vatican plus the exhilarating feel of the film. Tom Hanks, as expected, is something to watch out for. You would love how he captured the character he was portraying, maintaining what he did in The Da Vinci Code. Ewan McGregor is something to watch out for in the film. His acting powers added to the powerhouse cast that gave much anticipation for the viewers. How mysterious the film may be, I wouldn't definitely know how much of this film is true. It's fiction, much has been said. But there's more to what is written, see and compare.